Vicenza receiving Laser therapy for hip dysplasia & arthritis. At Williston Park Animal Hospital we offer Class IV Laser therapy to help your pet heal without drugs or surgery. Laser therapy is scientifically proven to reduce inflammation and pain for both acute and chronic conditions by utilizing the body’s own healing powers. Laser therapy treatment is safe, painless and fast. The laser light is delivered through a non-invasive handpiece to treat the affected area. Your pet will feel a gentle and soothing warmth. As the laser is administered, many pets will relax, much like you would experiencing a good massage. The almost immediate relief of pain will allow your pet to be comfortable and any anxiety that your pet initially experienced will dissipate. We have taken before and after photos and are amazed that after 20 minutes red and inflammed skin and ears will already be healing and we can visibly see the color changing to a lighter pink. There are no known side effects with this treatment. You might see a change in activity when your pet comes home. For some it might be increased activity and others may be more relaxed. This is due to the pain relief and reduction in inflammation. Can I combine Laser therapy with other treatments for my pet? Yes, Laser therapy can be combined with holistic modalities such as acupuncture and herbal therapy for the maximum benefit to your pet. It can also be used with traditional medication and pain relievers as well. 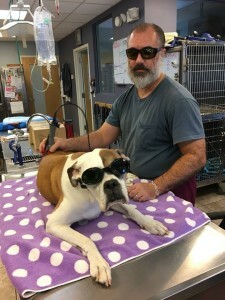 This entry was posted in Uncategorized and tagged companion laser, laser therapy, pain free treatment, surgery free treatment. Bookmark the permalink.